Celebrations at Seed of Hope! 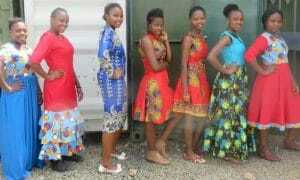 Graduates in their own designs. Each New Year at Seed of Hope begins with a flurry of activity as our teaching team work hard to enroll new students. Since January when Seed of Hope resumed learning, we have enrolled 116 girls to acquire vocational skills in the courses of their choice. Each course also now has a mandatory computing course so that all students are fully equipped to fit into the job market with complete confidence. The enrolment process is facilitated by our work in the community through our outreach programme that is run by Seed of Hope staff in the communities surrounding our centres. They help us to identify and build relationships with disadvantaged girls in the community in order to prepare them for enrolment at Seed of Hope. 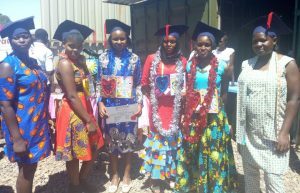 January was an exciting month as we also celebrated our Nairobi graduation. This was the 14th graduation since the implementation of Seed of Hope in 2002. The graduation event took place in our new Seed of Hope premises and it attracted a lot of people as the community had never witnessed such an event. The parents and guardians also showed up in larger numbers to witness their girls being crowned and issued with a certificate in their course of study. We had plenty of guests come to celebrate including our new chair of trustees from the UK who had been visiting our projects to see and learn what we do at the grass root level. He also had the opportunity to interact with our beneficiaries, staff, graduates and other stakeholders during his time with us. During the graduation celebration Sherry spoke with Caroline. She comes from a humble family of three siblings. Her mother is the sole breadwinner of a huge family of cousins, uncles and aunts who all live together. Caroline struggled to earn her secondary education certificate as her mother worked to provide the basic necessities for the family. After her secondary education, she stayed idle at home for 2 years as her mother could not afford to pay for her college. She was in the state of hopelessness when a preacher from their village informed them about the Seed of Hope centre, meaning in 2017 Caroline joined the dressmaking, fashion & fabric design course. In her two years of skills training, Caroline was ranked among the best students who showed great improvement and interest to her coursework. 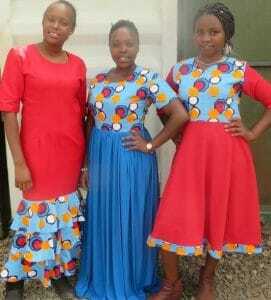 She then went for attachment at Nairobi Textile Business Centre, one of the biggest textile industries within the city. At first it was a challenge to commute every day from home to the city, but her mother and siblings supported her with bus fare and a few extra coins for lunch. Her boss was that impressed by her hard work that they began to refer clients to her, sent her to get supplies of materials and deliver products to clients in different places. At the end of the day, Caroline would be given some pocket money which motivated her to learn new designs. During the presentation of their project at the graduation, we were overwhelmed by the beautiful pieces of clothes she had made as she brought her graduation gown as well as 4 other gowns for the models who were showcasing her beautiful collections. All of Caroline’s family came to the graduation to celebrate her accomplishment. Sherry noticed a few of her family members were dressed up in nice African Kitenge designs so she took the opportunity to inquire where they were made and could not believe it when Caroline’s older sister said that Caroline had made all their clothes. Her mother who was so proud had this to say, “Today I am the happiest mother on earth because I can finally see the seed that was planted in my daughter. I would like to thank Seed of Hope and everyone involved in making this project a success.” Caroline’s family, friends and neighbours could not hide their joy as they asked Sherry to take photos of them. The best news is that up to date, Caroline is still working at Nairobi textile and she plans to save enough to establish her business within the same location as she has built a client base. Because of wonderful people like yourself we’re able to support young girls like Caroline who had lost hope in life. Through generous donations towards the Seed of Hope programme, Caroline is now living a happy life, dreaming to achieve greater things. Thank you for allowing us to equip and empower these young girls with relevant skills that give them hope, dignity and opportunity to be employed or self – employed becoming self-reliant and able to raise the standards of living for their families.